The Many Complications of a Dead Musketeer; Where the Corpses of Queens are Different from the Corpses of Commoners; What One Owes the Dead. Athos was suddenly, startlingly sober. One moment he’d been laughing and running with his friends, his head muddled, his vision blurring scenes and places. The next breath he was stone cold sober, standing in a narrow alley, his nose full of the stink of mud and the human waste that housewives daily emptied from their windows into the common street. His head hurt a little, with something that was not so much a hangover as the distant echo of a hangover. His shirt and hose stuck to him with dried sweat and felt prickly and cold against his skin. His tightly-laced doublet made his shoulder wound throb. He lifted his hand and wiped his forehead. His side hurt with burning, insistent pain. The wound he’d received from Jussac the night before was still bleeding and perhaps starting to become infected. Surely Athos’s reactions showed a touch of fever. Because he’d seen death many times. Death, in the battle field or in private brawl meant very little to French noblemen, used to and encouraged to quarrel over matters of honor, over matters of the heart, even over trivial matters. It had been a long time since Athos had learned how quickly the flame of life could be extinguished in combat. But it had been even longer since he’d seen the body of one killed dishonorably. A murdered corpse. And, without being able to point to anything specifically, he was sure this man had indeed been murdered. There had hardly been time for him to challenge anyone, to engage in a duel with anyone. Athos stepped forward, a prickle of uneasiness at the back of his neck. He knelt by the body, ignoring the smells that accompanied death. The dead man must be very young — there was so little breadth to his shoulders. Short too, shorter than their new friend, D’Artagnan. The hair that escaped from the broad brimmed musketeer hat was as pale-white as moonlight. And the light of the lantern hanging at the door to a tavern three doors down was enough to see that the left hand, extended to the side of the body — palm up as if in supplication — was white and pale and unmarred by calluses. 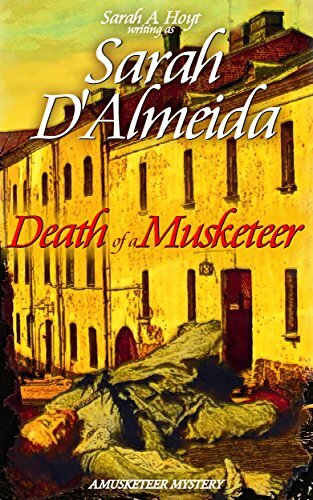 This meant that not only was the man young and, undoubtedly, had led such a sheltered life as only certain wealthy families could afford, but also that he’d been a musketeer for a very little time. Because the wielding of the sword, the gripping of the oft ornamented pommel, the force necessary to parry and thrust with the blade, soon turned the hands of those sons of the nobility who made the sword their profession as callused, as blistered and as rough as the hands of any farmer’s son. From beneath the neck, on the right side, a little pool of thick liquid — dark under the insufficient lighting — spread sluggishly on the muddy ground. Athos put his hand on the back of the boy’s head. It felt warm still. “Help me turn him,” Athos said. Porthos stepped forward, put a hand on each of the boy’s shoulders and easily, like a boy turning a rag doll, flipped the body so it was face up. In the effort, the hat went flying. Athos flinched as the corpse’s blue eyes appeared to stare at him. It was not a boy, but a young woman. She could be any age between sixteen and twenty, but Athos did not need to notice the gentle swell of breasts beneath the musketeer’s tunic to know that it was no man. Her forehead was too smooth, her nose too small, slightly tilted up. Her eyes were too wide. Her lips too soft and pliable. Lips that would have made many a suitor tremble. Her eyes looked puzzled, as if she couldn’t quite understand what had happened, and there was a small crease of worry on her white forehead. Without thinking, Athos brought out his handkerchief from his sleeve and wiped the mud and blood from the side of her face. Then he gasped, in turn. He jumped back, unconsciously tracing the sign of the cross over his own forehead — not in the carefully deliberate way Aramis did it, but in the frantic way of a child warding off evil. Athos shook his head, reflexively. D’Artagnan pushed forward and stopped at the feet of the corpse, looking hesitant. A half groan from Aramis answered him, a wordless crescendo of worry. It stopped fast and, without turning, Athos was sure his friend had bit his own tongue to stop the sound. Athos didn’t say anything. He hadn’t heard the rumors of Buckingham’s visit. But then he wouldn’t. Other than his two friends who knew better than to gossip to him, he spoke to very few people. Most of his days were spent in silence. Even his servant, Grimaud, had been taught to answer a gesture or an expression, which saved Athos the trouble of talking. He’d joined the musketeers as other men would join a cloistered order. In fact, it was only the consciousness of being the last one of his noble line that had kept him from donning some russet habit and hiding forever in the dark bowels of a monastery. That, and the memory of his sin. Looking at this dead woman now, brought his sin to mind again. The thought of another woman he’d seen dead. His wife. His… wife. He ran his hand over his forehead and eyes, as if by doing so he could remove the veil of the past and the thoughts he didn’t want to think. “I only say what I have heard,” Aramis said defensively. “Yes, but there are things that shouldn’t be said,” Porthos answered, his booming voice trying to control itself into a hiss and therefore hissing and booming, both uncontrollably. Athos knew that if he didn’t intervene, his two friends, so close despite being diametrical opposites, would engage in an endless round of bickering. He often ignored such behavior while the three of them were out drinking. He could not ignore it now. Aramis’s certainty and Porthos’s censure grated on his nerves like fingernails drawn, shrieking, down a blackboard. They were standing in front of a corpse that might be that of the queen of France. They were standing at the feet of someone dead by violence and stealth. And yet Aramis and Porthos would bicker as usual. At his words, the others fell silent and removed their hats also. Athos struggled for words. As a child, he’d been outspoken, fluent. Often he’d filled his afternoons with poetry. But in the last ten years he’d tried to silence all his words — internal as well as external. The fewer the words, the less they would reproach him and the less he would think of the crime that had sent him fleeing his earldom, his nobility, his responsibilities as a lord to don a musketeer’s uniform and an assumed name. The less he spoke, the less he would think. Or at least, that had been the theory. In fact, the things he refused to name and speak of often visited him in blood-soaked dreams that woke him, sweat-drenched and screaming, in the middle of the night. Yet, silence had now become a habit, a turn of mind, a form of thought. It took him several moments to collect his words. Around him, his friends were so quiet that he could hear, streets away, the solitary footsteps of lone passerby. Athos looked to the young man and met with a keen understanding and deep worry in the observant gaze. He nodded, in response. “Yes,” he said. Athos turned towards his blond friend. Aramis was not a stupid man. Neither was Porthos, though often the way they reasoned could give the impression of stupidity. Athos could not be bothered with stupid people, and he’d chosen friends he thought his intellectual equals. But Aramis’s intellect was so bound up with his upbringing — by a widowed, elderly mother who wanted only to get him into the church — that he thought as theologians argued: in circles and whorls, through labyrinths and twisting paths that arrived at the truth by a totally circuitous route. Aramis often had trouble seeing what hadn’t been stated several times over, in different ways and half of it in Latin. Porthos too, a man who reasoned with his huge hands and his overdeveloped senses, would not immediately leap from the idea of this dead body in an alley to the trouble that would ensue in the world at large if this were, indeed, the queen of France. Porthos, the direct man of action, found words a slippery adversary who wouldn’t meet him openly. And Athos looked around, at the still closed windows of the upper floors, at the deserted street, the lantern burning out the last of its oil in front of the tavern two doors down. Aramis was right. All the merchants in the street might be asleep, snug in their beds over their shops. But make enough noise and they would wake. And if they wakened…. If they wakened, the scandal would be out in the open. Athos grunted. He knelt and examined, as closely as the tavern light allowed, the small, white, flawless hands, and the corners of the eyes of the corpse. And there, they would be off on another round of the endless bickering that they enjoyed as much as other men enjoyed chess games. D’Artagnan looked up at him, and he met the gaze with a half-smile. The small man straightened himself in response, and turned away from the corpse, to face the other two musketeers. His hat, carefully clutched to his chest, was of an uncertain color between blue and black — as if the fabric had suffered one too many colorings. The two plumes were broken and half-bald, as if they had been played with by countless generations of toddlers. Aramis sighed. “I know a man,” he said. Athos smiled, but managed not to say that this was strange as, in fact, Aramis normally knew women. “But we’d share a dreadful secret,” Porthos said. “And have we not in the past?” Athos asked. His friends nodded. D’Artagnan, their new acquaintance, looked wide-eyed at them, but said nothing. “No.” It was D’Artagnan, his voice full of urgency. “No,” he continued as all of them turned to look at him. “You don’t want us to solve this murder?” Athos asked. “You don’t want us to hide the body?” Aramis asked. “You are too cowardly to aid in this?” Porthos asked. D’Artagnan shook his head. He looked from one to the other of them but, at last, he faced Athos. Athos felt as if the young man wanted to talk to him alone, as though having decided that Athos was the most likely to understand him. Or perhaps the least likely to shout him into silence or cast aspersions on his courage. Athos smiled a little, in encouragement, and the young man took a deep breath. “What I meant,” D’Artagnan said. “Is that before we do this, there is something else we must decide. What if this isn’t the queen? What if she’s just someone who died because she resembled the queen? Or someone who was killed by a jealous lover, or a controlling husband, or a refused suitor?” He took another deep breath, and looked around at them. Athos, confused as to why this mattered, was sure that D’Artagnan met with equally blank expressions from Aramis and Porthos. “Yes,” D’Artagnan said, impatiently. “Yes, but… There is this woman too. If she’s neither the queen, nor murdered because she looks like the queen, then we should let the law catch her murderer. If we don’t, we’re wronging this woman.” He gestured broadly towards the corpse. Surprisingly Porthos nodded, one second before Aramis. “Or the murderer,” Porthos said. Athos looked towards him, wondering what was in his friends’ mind. But Porthos’s blue-grey eyes were unreadable. Athos inclined his head. A half nod. “Or the murderer,” he said. Before he quite knew what he was about, he pulled his sword out and extended it over the corpse. A salute of sorts. The Gascon seemed to understand what Athos was doing and pulled out his sword, holding it so that the tip just touched Athos’s. Aramis was next. And then Porthos. “On our honor as gentlemen and musketeers,” Athos said. “We will find this woman’s murderer. Whether the woman be a queen or a beggar, we will see justice done,” he said. “One for all,” Aramis said. “And all for one,” the others completed in a chorus.